Climate change affects all living organisms; it has done so in the past and will do so in the future. However, current climate change is exceptional both in terms of the rate of change and the impact of multiple types of global change on individuals, populations, species, and ecosystems. 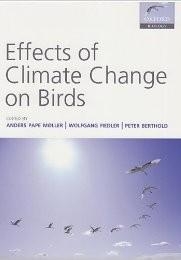 Effects of Climate Change on Birds provides an exhaustive and up-to-date synthesis of the science of climate change as it relates to birds. Compared with any other class of animals, birds provide more long-term data and extensive time series (some dating back more than 100 years), a more geographically and taxonomically diverse source of information, and a longer tradition of extensive research. In fact this research record exceeds what is available in all other organisms combined.